For more information please click the button below to view the whole poster. Working with Northern First Nations to maintain, strengthen, protect and develop political, economical, judicial, social, language and cultural, policies, inherent treaty and Aboriginal rights and to enhance quality of life while advancing the powers, authority and autonomy of Indigenous governments. Grand Chief Garrison Settee, challenged by Chief Eric Redhead, does his #IceRoadChallenge in Winnipeg on the Red River. He now challenges SCO Grand Chief Jerry Daniels and AMC Grand Chief Arlen Dumas to do the Ice Road Challenge! 1st Video- Bunibonibee Cree Nation Chief Tim Muskego, alongside Councillor Tessa Weenusk and Councillor Luke Muskego jigging on the Knee Lake Ice Road for the #IceRoadChallenge. 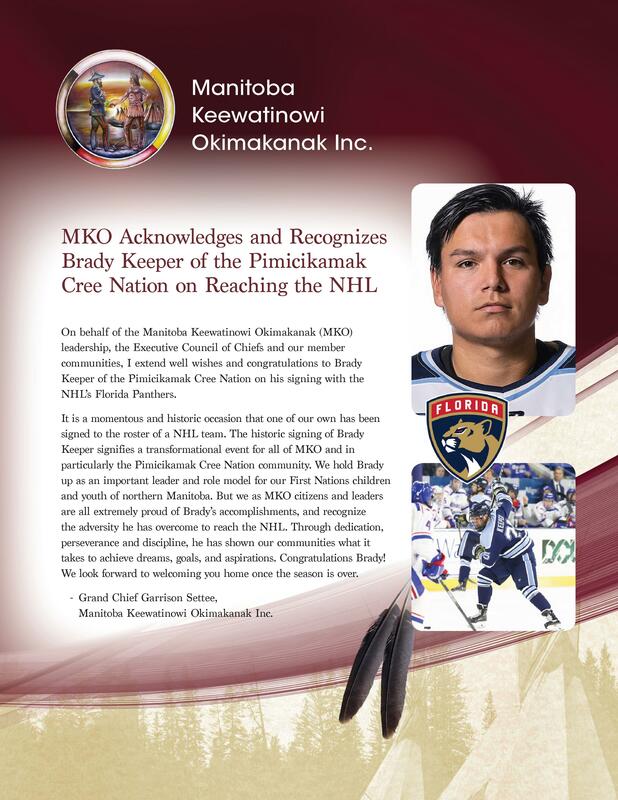 He challenges all of the MKO Chiefs to jig on the ice for the Ice Road Challenge, too. 2nd Video- Shamattawa First Nation Chief Eric Redhead and Council, with band staff all jigging for the #IceRoadChallenge. He challenges MKO Grand Chief Garrison Settee. 3rd Video- MKO Grand Chief Garrison Settee does his #IceRoadChallenge Red River jig on the Red River in response to challenge from Chief Redhead. Grand Chief Settee challenges SCO Grand Chief Jerry Daniels and AMC Grand Chief Arlen Dumas to do the challenge next. Prior to the opening of today’s Chiefs Assembly on Health Transformation, which is being held in Thompson in Treaty 5 on the traditional territory of the Nisichawayasihk Cree Nation, Manitoba Keewatinowi Okimakanak Grand Chief Settee was honoured to be bestowed through ceremony with his Chief’s headdress. Led by Elder Ed Azure, with support from Chief Marcel Moody of the Nisichawayasihk Cree Nation and Assembly of Manitoba Chiefs Grand Chief Arlen Dumas, the ceremony acknowledged the history, teachings, significance, and responsibilities of the leader bestowed with the traditional headdress. First Nations are signatory to Treaties 4, 5, 6 and 10.